Many years ago, in a land far far away, Vince Morlet and Alex Tung operated an award winning restaurant in Steveston, BC. This landmark operation was finally sold after 13 memorable years, but one constant at this bistro was the daily staff meal. All staff members would always sit, relax, not talk about work and enjoy dinner and camaraderie before a busy evening service. Occasionally Chef Alex would personally make grilled cheese sandwiches for the team and those were always the most popular and happiest family meals. When Vince negotiated an opportunity to operate a food truck at a purpose built and exclusive food truck pad at the BC Ferries Tsawwassen Terminal, the concept for the new truck was easy. It had to grilled cheese; delicious, comforting, inspired but approachable MELTS, cooked with care and made with high quality, thoughtfully sourced ingredients. Thus, the Melt Shop Truck was born. Want us to bring delicious MELTS direct to you? 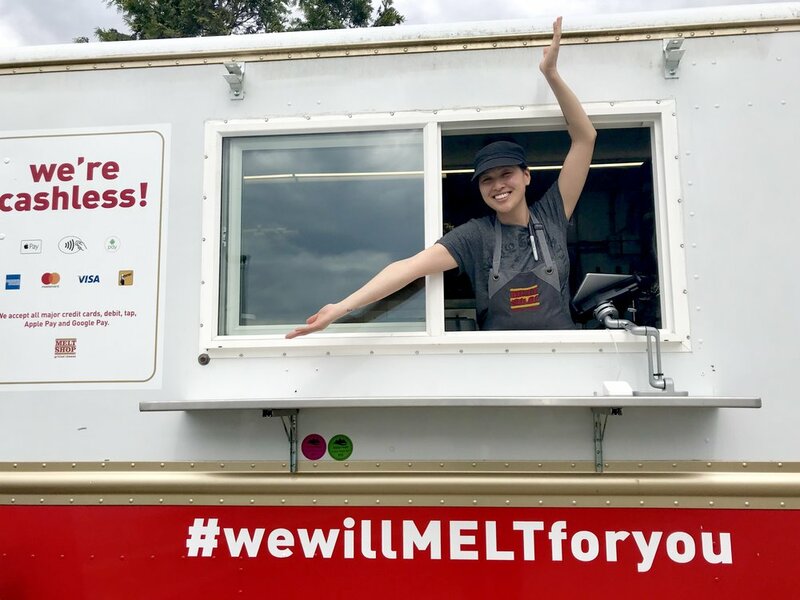 We can drive our Melt Shop Truck right to your location. We cook for you, you eat, it's as simple as that! Great for corporate events, movie set catering, weddings, after parties, birthday parties, block parties, campus events or any other event where you’ll have hungry people! It doesn't always have to be grilled cheese. With decades of award winning hospitality and restaurant experience, the Grand Fromage (Vince Morlet) and the Head Cheese (Chef Alex Tung) can custom tailor a catering service for your event. From an outdoor canape/cocktail style party to a multi course, plated tasting menu, we have the experience, infrastructure and team to execute at the highest level. Select as many or few add-ons as you like. For groups over 120, reduce from 5 to 3 sandwich options to streamline service. 5% GST and 15% gratuity will be added to final total. A double cheese melt with lots of nostalgia. Aged Cheddar & American cheese melted together for gooey goodness! For any inquiries, feedback, issues and concerns, please email us at info@meltshop.ca We'll get back to you ASAP. We promise. Feel free to reach out directly to one of our cheesy team members.